Recently I've put out a little challenge to myself. "Use what I already have on hand as often as possible." No doubt I have loads of Christmas decorations all packed away in tidy clear tubs with labels on them just waiting to be opened and displayed all over the house. But today I was in the mood to create. It was so pretty outside that I didn't want to come inside. So after spending some time in the veggie garden and harvesting a few veggies I figured the next best thing to gardening would be to work on the front door decorations. Down came the autumn decorations. Sticking with my new challenge I'll be using the same urn for the Christmas arrangement that I used for the autumn arrangement. Rummaging around in my box of 'gently-used arrangement paraphernalia' I found some willow branches and some berry branches. With clippers in hand I then went to the garden to snip some magnolia branches and retrieved some spray paint off the shelf from the garage. Note: Best to use latex gloves on hands and newspaper under the project. The good thing about this project is I was still outside enjoying the beautiful day. 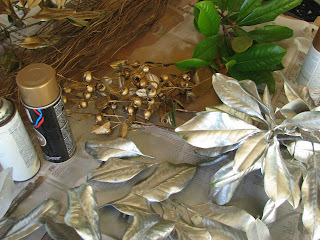 Using silver paint I covered the tops and bottoms of some of the magnolia leaves. 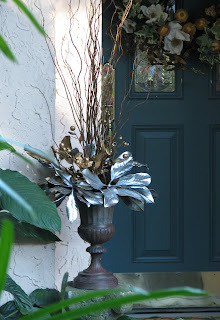 The black berries and a few more of the magnolia leaves were sprayed with gold and the willow with copper. Took all of about ten minutes. 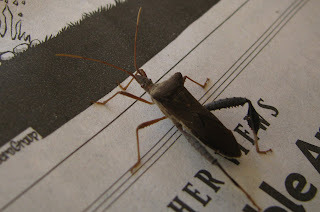 This fellow came out of the magnolia branches. Another good reason to keep this project outside. Very simple. Very easy. Didn't cost a penny. Starting with the bottom leaves and working up and in it took about 10 minutes. I can see only the top 1" of each of your photos due to my slow network. However, I can see enough to know your decorations are beautiful! Very creative. Oh -- backup your photos often! :-) Don't be like me. Lisa, Thank you. Of course the great thing about paint is you can choose any color you like. Cameron, Thanks for being persistent. It's too bad you are still having computer problems. Last spring my computer crashed and I learned my lesson about backups (lost so many precious photos). Now I have an external harddrive that automatically backs up everything. I'm also thinking about subscribing to carbonite... an offsite backup service. A backup of the backup! Outstanding Meems! I love it and the price. It's classy. Hi Meems, it's such a delight to see your creativity. Your arrangement is so attractive and the soup made me hungry. I love to read what you write about family time (in your last post) and your photos are always a treat! Oh, that's so ingenious! I love your arrangement and I applaud your getting started early on your decorations. By the way, will the magnolia leaves droop and wilt in a few days time? What do you do for it? Hi Meems, thanks for making it feel a little warmer here with your glorious day outside. I love magnolia leaves and your arrangement is stunning. 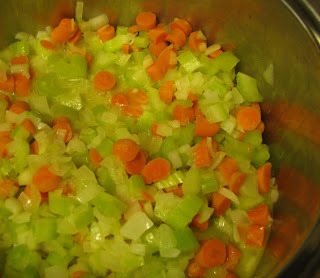 I like the photo of the cut up veggies just like it was, good enough to eat! I am feelin a little more frugal here too, and have more decorations than any one person should be allowed to have, even after giving many tubs of them to the offspring last year and setting many boxes by the curb when we moved from the Texas house. STILL too many! Goodwill, here we come. I am much more into gathering stuff from the garden for a temporary arrangement, then back to the brush pile for the birds with it, no need for more storage tubs! What a beautiful arrangement Meems. Repurposing what you have is great! I love spray paint, it makes everything better. :) Glad you are feeling motivated now to get your Christmas decor out. That soup looks good too. 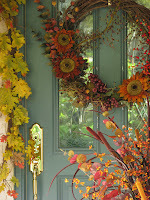 What a lovely way of decorating your front door. here in the UK we tend to have Christmas wreaths on doors but not at other times of the year. That is beautiful! I love paint!! I actually boiled my turkey carcuss Monday, pulled the turkey off the bones and froze the broth. I have my turkey soup starter all ready to go. Your soup looks really good. Anna, You can't beat the price nor the time it takes to put it together. Thank you. Kanak, Thank you! I appreciate your comments about the family time. We are holding those times we have together even more dear to our hearts as world situations get crazier and crazier. Glad you are doing well after the very sad events in your country. Sunita, I think soup makes a great snack. I've been known to eat it mid-morning evening on a chilly day just to tide me over until lunch. Great question. The magnolia leaves dry out naturally quite nicely. If left unpainted (which I do as well for other arrangements) they will look good until well after Christmas. Painted they will last a little longer. Of course, if you don't want them to dry to can put them in oasis (a medium that holds water) and they will last a VERY long time. A wonderful post on so many levels...clever, frugal, imaginative, lovely and delicious! How delightful to be able work in your garden and not be bone chilled cold! Yes, we might be a little bit envious...but temperatures will be in the mid fifties today! Have a lovely day! Magnolia leaves are some of the best and easiest to work with. 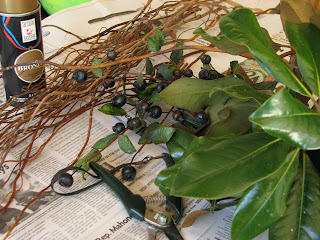 Today, I'll be working on more arrangements using ligustrum, indian hawthorne and crape myrtle branches. I've really been tryingn to simplify the Christmas decorations over the last several years. Less is more! I definitely need to purge more of the tubs, too. Racquel, The cooler weather really helps to get motivated for Christmas decorating. I can't tell you how many years I've pulled out all the decorations dreading to sweat while getting them out and up. I've cranked up the Christmas tunes and donned a light sweater and I'm all in the mood suddenly. Thanks for the inspiration over at your blog. patient gardener, Thank you. That's an interesting fact I didn't realize. Here, we keep something on the door all year long. Not always a wreath- but some sort of arrangment. I change mine out with the seasons just for the creative fun. Darla, I'm with you. Paint is an economical and very creative way to change up just about anything. I am so excited about the cool weather I went ahead and used up the last of the turkey to make some warm soup. You are smart to have yours ready to go when you need it. So often the colder weather 'up north' doesn't make its way down this far. When it does we are happy little clams. Since we only get the fringes of it and our equator location warms us up during the day, it makes for some tourista-type sunny days. Can you tell I'm thrilled? Glad you are warming to the 50's -- if the sun is shining as well that is what I call a perfect weather day! That soup looks yummy and your arrangement looks so nice and festive! Great work meems! Spectacular! What a delightful post. The arrangement looks gorgeous and the soup looks like true comfort food, perfect for this cold Florida day. You've inspired me to go make some soup. That is a beautiful arrangement! It is simple and elegant at the same time. BTW, I can't imagine being in shorts and T-shirts in December! I do love our four seasons though and I enjoy the break from the garden for a few months...except that it would be awesome to harvest organic garden veggies all year long. I might be more in the Christmas mood if I could work outside...sigh. How very clever of you to pull all those things together. Makes a wonderful arrangement. Your soup sounds yummy. I love any kind of 'cream' soup! Meems you are on task. I've still got the scarecrow on the front porch. I'm still back in November. I love your new front door look. Clever ideas! Thanks for the Thanksgiving greetings. Hope you had an enjoyable one. Oh, and by the way, happy belated birthday! 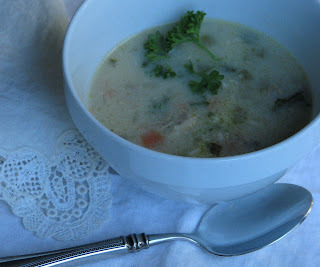 Susie, homemade creamy turkey soup is a welcome treat on a chilly day. Thanks. Karrita, I hope you liked your soup. I'm glad you liked the arrangement - I've been at it again today. After yesterday, I inspired myself to more projects today. Connie, Thank you. This is my first year to grow a veggie garden. I had one in the spring and now the fall. 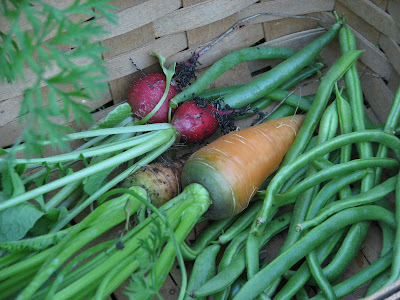 It is a real treat to have veggies this time of year, too. As a matter of fact I was in the garden mid-morning for a couple of hours today in shorts and two shirts. It was perfect. Susan, You've still got plenty of time to switch out that scarecrow. Thanks for the birthday greetings. We had a great Thanksgiving, too... thanks. beautiful! i love this. i actually have been trying very hard to stick with what i have too. i have some branches i am going to paint white and now thanks to you i will add some other greenery at the bottom to make it look complete, i couldn't get inspired until i saw your beautifully done urn. oh that soup looks great, wanna email the recipe. i made turkey soup different this year adding lentil, garbonza beans and barley. trying to help dh keep on track. it was so different and good. are you going to show me that beautiful wreath that you changed out too? please! marmee, it's okay. I can certainly see why you could miss a post or two... it is hard to keep up with sometimes. I think you can see the bottom of the wreath in the photo that shows the urn. I have made some really fun urns for the dining table. Sprayed crape myrtle branches, picked up some free Christmas tree branches used some pine cones and some pheasant feathers... it was VERY fun. Maybe I'll get a post up showing them... but I guess I need to take some photos first. I wish that was the only kind of decorating there was to be done. I get kind of bored with the ordinary stuff... making stuff is much more inspiring. I'll try to remember to e-mail you an idea of the soup. I don't really have a recipe-- it's all in my head but I'll give it a shot. YOur new version sounds delightful. I like the idea of branches painted white with greenery added. That arrangement has real WOW factor - and I love that you did it with what you had. I've found if you challenge yourself to use what you have, sometimes it frees your creativity. It sure came together in your project. Now I want to go see what I can make. 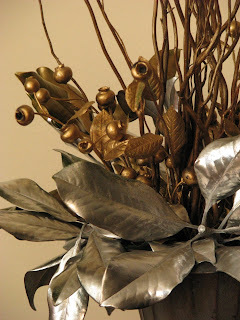 Your silver magnolia arrangement is fabulous Meems. Better than anything you could buy and the price can't be beat. I love repurposing garden urns and items too. We may as well plus as gardeners we have so much supplied by Mother Nature to select from. Maybe the economic downturn is actually good ~ teaching us to use what we have?? Meems, this is GORGEOUS!!! It looks like something my mom would do. She got all the creativity in this family and hasn't shared a bit of it. LOL. I'll have to show this to her. I know she'd love it too!